OCRC is home to a wide range of in-patient studies, from First in Man trials to drug interactions and food effect studies. 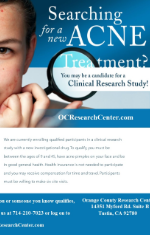 Sign up for a clinical trial today! Did you know about 1 in 3 adults in the United States, an estimated 68 million people, have high blood pressure? Hypertension is more common as people grow older and raises your risk for heart attack, stroke, eye problems, and kidney disease. Orange County Research Center, located in Tustin, CA, is a private medical facility founded in 1985. We recruit, manage and execute cutting-edge clinical research protocols for pharmaceutical and biotechnical companies. Some areas of focus are Cardiovascular Disease, Hypertension, Dermatology, Wound Healing, and Diabetes. Orange County Research Center has participated in over 400 clinical trials that have advanced the development of many new treatments. Contact us today for a FREE Health Screening! Sign Up for OCRC Newsletter! "I would highly recommend OC Research. The staff is superior in their care and knowledge. I always feel welcomed and well cared for. 10++"
Our PK Unit has just completed its expansion to 10,000 sq.ft. please fill in your email and/or home address below. Like us to stay in touch with us through Facebook! ©2019 Orange County Research Center.